Broods - 'Conscious' album review. 12 seconds is all it takes for Broods to show that they’re not messing around on ‘Conscious', their second album, the follow-up to 2014’s debut, ‘Evergreen'. The arrival of the opening track and first single ‘Free’ is marked with vocalist Georgia Nott’s a capella call of, “I’m free! I’m free! I’m free! 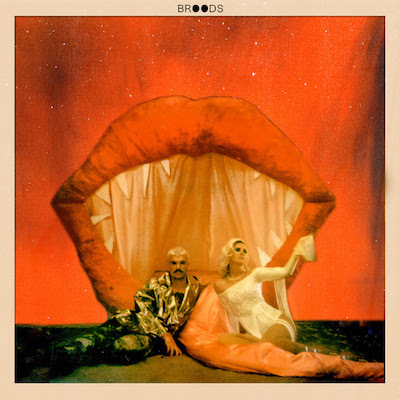 I’m free!” Her brother Caleb then enters with pulsating synths and the fierce beat that tells us Broods are starting this record as they mean to go on: arresting, captivating, and liberated. The development of Caleb’s production skills have allowed the duo to take a great leap forward in their sonic capabilities in the last two years, and ‘Free’ is a powerful, declarative demonstration of that. What’s clear is that Broods have found strength in no longer being new to this business. The lyrics on ‘Conscious’ show them to be less innocent and more empowered. It’s hard to imagine Georgia sarcastically snarling, “It’s clear you think that I’m inferior,” on a track from ‘Evergreen’. This new strength is matched by the arrival of an industrial influence in the duo’s production. Caleb states that the album “goes for the throat,” and it’s hard to argue with him when much of the album sounds as if it’s ready for arenas, potentially even stadiums. One recalls the debut-to-sophomore transition of Lykke Li from a dainty songbird on tracks such as ‘Time Flies’ to the growling, drum-beating force of nature that declared, “I’m your prostitute, you gon’ get some.” Georgia Nott’s transformation is not dissimilar, properly getting stuck into her role as a powerful frontwoman this time round, wailing at the top of her lungs and asserting her strength. A high point of the album comes in the form of ‘Heartlines', co-written with Lorde, produced by Joel Little and perhaps the most neatly-crafted cut of the lot. (You might even mistake the owner of the pipes that deliver the track’s first line for Lorde herself.) The anthemic cry of, “I’ll pick you up at midnight / We’ll run to beat the sunlight / We only get the one life,” in the chorus is a delectable expression of the sort of youthful, hopeful and energetic approach to love that shines through on many of the album’s most enjoyable tracks. The wide-eyed, open-hearted way that Georgia sees the world is a delightful feature of ‘Conscious’ that shines throughout its 48 minutes, perhaps never brighter than on ‘Heartlines'. The love in these songs may be ‘full-blown,’ but it always remains grounded. “Don’t need an apology to make it right / I just need you as a whole,” Georgia whispers on the heart-melting ballad ‘All Of Your Glory', the most emotional track on the album. The understated nature of the production allows the warm, unconditional love in the lyrics to shine. The success of this track in pulling at the heartstrings is particularly evident as it follows the Tove Lo collaboration, ‘Freak Of Nature', which fails to succeed at the soaring, emotional heights to which it aims. Attempts at making it the album’s epic focal point don’t pay off, and it’s left as a bloated and airy misfire that underuses its guest-vocalist. One can’t help but feel that the Swedish alt-pop star’s contribution to the album would’ve been more effective on an upbeat track, as she is all but washed away by Alex Hope’s gargantuan production on this underwhelming number. Far better is ‘Recovery', the second of two tracks featuring production from Hope, known for her work with Troye Sivan on his debut album, ‘Blue Neighbourhood’ (which featured the Nott siblings on ‘EASE’). The title may see them sailing very close to the wind in terms of comparisons to CHVRCHES, but this is a full-bodied, full-hearted anthem on which Georgia declares that she will “be your home, keep you warm when it’s cold” and “lead you on the road to recovery". It matches real lyrical truth and depth with fantastic pop production in a way that artists with years more experience than Broods often struggle to pull off. Make no mistake: ‘Conscious’ is a pop album. It’s hard to find a track here that would be considered out of place on a Katy Perry record. Georgia has stated that the album’s title refers in part to the fact that they are “very conscious of what we want to achieve". They did not sleepwalk into this more mainstream territory, but clearly aimed right for it. That being said, their transition, or indeed their ascension, has none of the ungainliness of many other occasions when artists simply aim to up their profile with Big Pop Songs that don’t suit them. There’s not a Max Martin collab in sight. By looking at what is left-of-centre in pop music in 2016 and aiming there, they haven’t jumped into the mainstream feet first, but instead used the ladder and stayed in the shallow end. It’s a style and territory that suits the duo – Georgia’s voice soars effortlessly through tracks such ‘Hold The Line’ and ‘Heartlines’ and Caleb’s production feels remarkably at home at a larger scale. Running at 13 tracks, ‘Conscious’ is a little baggy, particularly towards the album’s close. ‘Bedroom Door’ is unlikely to be anyone’s favourite Broods song, and while ‘Full Blown Love’ can’t be seriously faulted as a song, we have, to all intents and purposes, already heard it by the time it rolls around as the tenth track. Such slumps are redeemed at the album’s close with the title-track, a powerful and brooding (no pun intended) number that screams out, “Wake me up and keep me conscious." It’s an undeniable highlight, and a contender for one of the best closing tracks of the year. The image conjured up by the song titles is that of a duo with real power and momentum behind them. They are both ‘Conscious’ and ‘Free', speeding into their sophomore album with more confidence and self-determination than ever before. If there has been anything difficult about their difficult second album, they’ve done a great job of hiding it. They may suffer a little from a tendency to throw the kitchen sink at a few too many tracks in an attempt to make them as big as possible, particularly when their more restrained moments can prove the most rewarding, but this works more times than it fails. Besides, the ambition is admirable and encouraging, and entirely fitting with the all-guns-blazing attitude with which they confidently deploy on ‘Conscious'. YOU WILL LIKE, IF YOU LIKE… MØ, CHVRCHES, Troye Sivan, Lorde, Ariana Grande, Purity Ring, SOHN, Wet, Banks... and the soundtracks of YA dystopian film-adaptations. - “I’ll pick you up at midnight / We’ll run to beat the sunlight” … “Lying in bed wide awake...” – Georgia Nott might be suffering from insomnia / bouts of excessive night-time energy. - “You got the key from under the mat.” – If anyone wants to burgle the Nott residence, looks like it might be pretty easy. - “Whatever helps you sleep at night.” – Georgia is far more concerned with the sleeping patterns of others than with her own. - “We drive into the night / Away from the light.” – Seems that night-time drives are a favourite head-clearer of Georgia’s. And also that she should really see a doctor about her sleep issues. MUST-LISTEN: ‘Free’, ‘Heartlines’, ‘All Of Your Glory’, ‘Recovery’, ‘Couldn’t Believe’, ‘Conscious’.